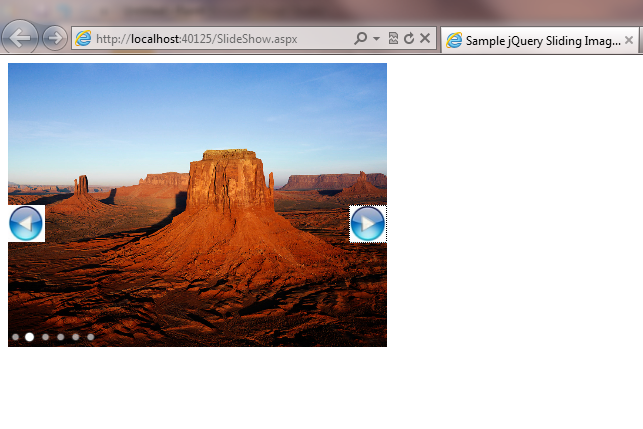 Here I am going to explain you how you can make a sliding image in your web application using jQuery. There are many ways to implement this feature in your web application but Using jQuery it will be very easy and you don't need to use any timer control for sliding it automatically. First we will download the required jQuery Library for this purpose. Also I have attached all these plug-ins as attachement. Below is the sample image you will get after creating this application. In this code you may change the image name based on the images you are using. You don't need to worry about the size of the images as I am adjusting the size of the images to fit it into the space. Thanks for sharing, i tried this previously bt not succeed. Images are displaying one by one. As in your screenshot i want. I tried with same code u provided here, but not succeeded..
@SonyMadhu: I hope it is working now in your system.. I tried alot to do slide show. Finally i got the solution with simple presentation.. But i got small problem to my page..
Now when i select menu item sub items are not visible for me, which are hiding by slide show. Can you help me for this? Use div tag around your menu. Otherwise menu will go behind the controls. i can run that cod but that time page autometicaly redirect to the google.com .